DAY 1: ARRIVE IN KATHMANDU. If you are flying through Bangkok, the flights usually arrive around midnight. The Amari Hotel at the airport is convenient. Take the morning flight to Kathmandu, the capital of Nepal. Flight time is 3.5 hours. Just before landing in Kathmandu you will catch your first glimpse of the mighty Himalayas. You will be met after clearing immigration and driven to the Vajra Hotel, which is situated on a hill above the Thamel district of Kathmandu. We will then meet with the local trekking company for orientation and last minute questions. You have the rest of the afternoon and evening to relax and explore Kathmandu. DAY 2: REST DAY IN KATHMANDU. A good day to rest up from the international flight, adjust to the jet lag, and purchase any last minute items for the trek. This day provides a cushion in case you experience flight delays or lost luggage. Enjoy the hustle and bustle of the Thamel. Climb the 300 stone steps amid the monkeys to the great stupa of Swayambhunath. DAY 3: FLY TO LUKLA, TREK TO PHAKDING. The 40 minute flight from Kathmandu to Lukla offers amazing views of the tallest mountains in the world. After landing at the 9,300 foot high airstrip, we meet our trekking crew and head out for the half day walk to Phakding. The trail follows the steep sided Dudh Kosi valley, passing through forests of blue pine, birch, oak, juniper, and rhododendron. We descend to the village of Chaplung and then on to Thado Kosi where we cross the bridge over the Kusum Khola. The next village is Ghat (or bridge in Nepali). We hike up the Dudh Kosi river to Phakding, 8,660 ft, where we camp for the night. DAY 4: TREK TO NAMCHE BAZAAR. At Phakding we cross the river and continue up the valley through the villages of Zamphute, Totok, Bemkar, and Chumoa. Each village is dotted with teahouses, small shops and lodges. After a few hours we reach the entrance to the Sagarmatha National Park just outside of Monjo at 9200 ft. Park permits will be checked and then we will hike down to a long suspension bridge across the river. At the confluence of the Dudh Kosi and the Bhote Kosi the trail crosses another long and high suspension bridge. Now begins a steep hike to Namche. From the ridge you catch the first views of Everest. We finally reach Namche at 11, 300 feet for a well deserved rest. DAY 5: ACCLIMATIZE IN NAMCHE. This prosperous town is the gateway to the Khumbu. It is surrounded by three majestic mountains: Khumbila to the north; Kwangde Ri to the west; and Thamnserku to the east. There is plenty to do in Namche. A pleasant walk up to the National Park Information Center to view Mt. Everest can be combined with a visit to the Namche Monastery. An optional scenic day hike to Thame to visit the monastery there can be arranged. DAY 6: TREK TO THYANGBOCHE. As we leave Namche we can visit the Sherpa Cultural Museum and view the photographs of past ascents of Everest in the adjoining hotel. From Namche the main trail is high above the river and fairly level. We come to the village of Kyangjuma where the panoramic views are outstanding. The top of Mt. Everest is visible above the Lhotse Ridge with the impressive Ama Dablam to the right. We pass through the village of Sanasa and soon begin the descent to the bridge across the Dudh Kosi. You might see pheasant and Himalayan Thar (wild goats), but they are more plentiful on the other side of the river. The trail crosses the suspension bridge at Phunki Tenga (10,600 ft). The walk up the hill to Thyangboche passes through forest and shrub. The entrance to Thyangboche (12,700 ft.) is through an arched kani, whose purpose is to cleanse people of the many feared spirits before entering this sacred area. In addition to the impressive monastery, a Sherpa Cultural Center shares the meadow where we will be camping. The monastery is open to visitors. DAY 7: TREK TO DINGBOCHE. Upon leaving the camp, we descend through a beautiful forest to Deboche where there is a nunnery. After crossing a narrow little gorge on a short suspension bridge over the Imja Khola, we follow the main trail up to Pangboche. The trail passes walls of mani stones and rises above the tree line to Pangboche at 13,000 ft. The oldest Sherpa monastery in the Khumbu is located here. It was established around 1660. Soon the canyon widens into alpine meadows and the trail passes the yak herding areas of Shomare and Orsho. The route to Dingboche veers to the right after Orsho and descends to a bridge and then on up to Dingboche at 14,270 ft.
DAY 8: REST/ACCLIMATIZE IN DINGBOCHE. Another all important acclimatization day above 14,000 ft. A half day hike up to Nangkartshang peak will help to acclimatize, as well as provide spectacular views of Ama Dablam and the other nearby peaks. DAY 9: TREK TO LOBUCHE. We hike up over the ridge and follow a gently climbing path until we descend to the bridge at Thuklha at 15,000 ft. After Thuklha, the hill becomes steep. At the crest there are many memorials to Sherpas and climbers who did not return from Everest. The stupendous views are the reward for this tough ascent. From here the trail climbs gently to Lobuche at 16,200 ft. At this altitude the nights can drop well below freezing, but when the sun comes up, the mornings should be pleasant. Mt. Everest is hidden from view by the impressive Nuptse. DAY 10: DAY TREK TO KALA PATTAR. The trail continues up the valley, rising gently at first and then twisting and turning through the rough moraine of the Kangri glacier. The trail then smooths out as it nears Gorak Shep. Here we turn off the main trail to the Everest base camp which is another 3 hours farther. There are no good views of Everest from the base camp. We begin the ascent of Kala Pattar, or Black Rock in Hindi. Upon reaching the summit, and out of breath, we are rewarded with breath-taking views of Everest, the Khumbu ice fall, Lhotse, and Nuptse. There are incredible views in every direction. After taking it all in, we descend back to Lobuche. Day 11: TREK TO THYANGBOCHE. Coming down is a breeze compared to the hike up. Instead of returning through Dingboche, we continue on down the valley through Pheriche to lower Pangboche and then on to Thyangboche. Day 12: TREK TO NAMCHE. We retrace our steps to the village of Sanasa, where the path splits. Those who want to return to Namche by the quicker and easier route can take the same route as we took on the way up. Those who are up for more adventure can take the path that climbs up to the villages of Khumjung and Khunde. 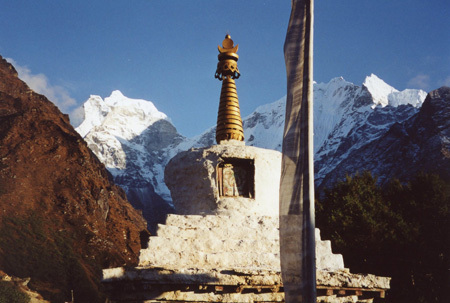 We can visit the Khumjung Monastery which houses the last remaining yeti scalp in the Khumbu. In the adjoining village of Khunde we can visit the hospital that was established by the Himalayan Trust in 1966. We then descend to the abandoned airstrip at Syangboche and down into Namche. It is possible to get a hot shower here. Pick up those last minute bargains. DAY 13: TREK TO LUKLA. This is a long day, but it is the last day of the trek, and the last night in a tent. DAY 14: FLY TO KATHMANDU. Check back into the Vajra Hotel. Wash away the glacier silt in the hot showers. Sleep in a bed. DAY 15: DEPART KATHMANDU ON INTERNATIONAL FLIGHT. All Accommodation in KTM with breakfast. Camping accommodation as per the program with all meals during the treks. English-speaking guide in monasteries and while trekking. All transportation from KTM Airport pick-up to departure. 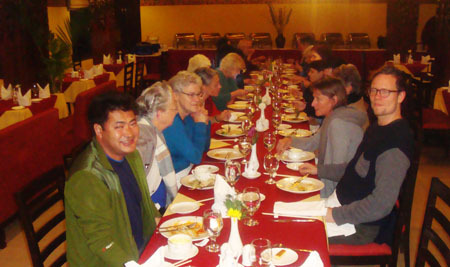 Alcoholic and non-alcoholic drinks and food in Leh and Delhi. International Air ticket to and from Delhi. Laundry and other services not mentioned in the package. If you need any arrangement, please let us know. IMPORTANT NOTE: Whilst every effort is made to keep to the above itinerary, clients will hopefully appreciate that this is Adventure Travel in a remote mountain region. There will quite likely be changes to the itinerary in terms of anything from on-the-spot choice of campsite to when a rest day is taken. Weather conditions, road conditions, vehicle breakdowns off the beaten track, local availability of horses or yaks, can contribute to the need for changes. The Trek guide will do everything in his power to see that you are inconvenienced as little as possible in such circumstances. Timings are approximate.